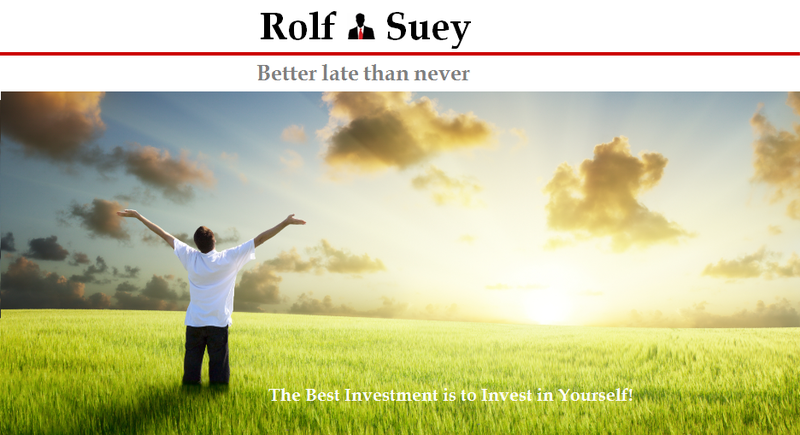 Rolf Suey - Better Late Than Never: STI goes below 2630 - Second benchmark breached, Scoop Again! 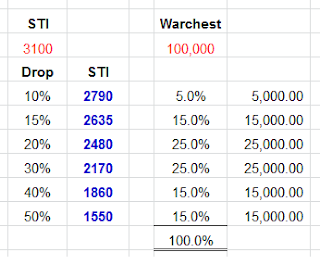 Refer to my previous post here where I discussed a simple method of dispensing my warchest. Consider 3100 as benchmark, and using 10% drop as the first reference, STI at 2,790 is the first signal for firing. The next reference is 2635, a further 5% dip of STI. In your own designed spreadsheet, you can create your own benchmark. Warchest amount listed below is arbitrary and not my Warchest amount. Yes, 2635 was breached today! STI closed at 2630 today. According to plan, I initiated my second scoop today as follows. Today's scoop only begin briefly and was hugely incompleted due to my busy work schedule. I shall continue next Monday! Hmmm.....will the next trading day be a "Black Monday?" It is left to be seen! Using STI (heavily geared towards banks and telecoms) is somewhat macro top down. But you don't buy into the STI ETF, instead you bought into individual counters - bottom up? Is investing/trading an art, a science, both or none? That's the questions. Haha.. you are right and always sharp to point out when things that does not seem so right. Since young, I respect rules, but hate to be bounded by them. I also uses my gut/instinct more (as I my previous post) and it's been smooth sailing. Perhaps, considering I m working full time, physically n yes mentally also, this mtd acts like some kind of "alarm" telling me "time to act". As I m repeatedly said, what is suitable for one, may not be always so for the other. Know urself well n know what u r doing! Yes, many roads lead to Rome, but make sure u at least plan the right one and walk it. I like Platypus! So unique and yet versatile. Thanks for introducing this animal. I believe investing is none of the above. As an extremist sometimes, I believe investing is more a philosophy of understanding and controlling oneself, so thoroughly that u enlighten n evolve acquiring special sets of ability to somehow able to see what is going to happen into the future. It is liken to life journey! Ha Rolf, it's both for me, like everything in life. There is randomness, yet there is trend in the market. There is law in nature, yet there're also miracles that defy nature. Well said and I totally agree with you that it includes both. And many other things as well. In my opinion, life do includes science, art, nature n everything. That's y I reckon investing is likened to life. You scoop stocks like scoop ice-cream. At the rate it is going you're going to scoop again soon. No doubt, I love ice-creams. But scooping too much and eating too much and too fast also no good. In fact my cash-stock ratio is still almost close to 2:1 now, hence I guess I am still enjoying my ice-cream. Can share why M1 and not Singtel or StarHub? I do own Starhub also n more. :-) I always use gut feeling, so reason/analysis is secondary. Thus, do not listen to my crap too much... hahaha LOL. I reckon M1 has an attractive dividend of >7%. Highest among the 3. Even in 2016 of M1 were to pay out the least div since 2010 which is $121mil vs 191mil (2015E), the least ll still result in a decent 5% yield. I m happy! M1 share price is the most beaten of all the 3, simply bcos "gurus" say it is most vulnerable to Possible fourth operator! Hopefully Singapore or Temasek ll not be so insensible to introduce a fourth operator in this really "rosy" times? Of course there are more other reasons n some in relation to the strategy in creation of my own portfolio, but it will be a damn long story! How about u? Which of the 3 ll u go for? But "gurus" outside keep saying it will drop further leh, as retail investors, how ah, "we" are confused. Stick to experts say or stick to plan? Nobody can predict the market nor oil price. When oil crossed $100 many yrs ago, experts predict $200. When it tanked to $40, expert say $20. Now it floors at $30, some say $10. You know urself best! Even a doctor cannot tell u more about ur body than urself. I personally had this experience n frankly tell my first specialist off when he started his crap! My second specialist of many yrs is totally diff, he listen, respect, understand n care for the patient. Wat's impt is to listen to ur inner voice deep down. Then carved out a plan after careful consideration, preferably in anticipation of what is gg to happen if u somehow noe it! You know urself best. Not the experts! Prediction or Anticipation? U decide? You should emerge richer after this episode. Great plan. Hmm... I hope so, and this richness must be sustainable over a long time. maybe only possible if I become more knowledgeable/wiser about life. The table is arbitrary and not my plan n not my warchest as I mentioned in this n previous article. It is more of a guide for readers to devise their own strategy. But the stocks I scooped are mine! Starhub I already owned way before the bear! Hence for a start, I guess most of u here misunderstood, hence the questions asked! and if u look at the table, this is warchest plan n not my already vested portfolio plan. Hope u do not misunderstand. I also bought into m1 (2.57) and singtel (3.43) recently. Barbell strategy - buy the best and the worst, according to Nicholas Nassim Taleb! Plan is sort of similar but figures in the table is arbitrary n not my plan, really. A plan is better than no plan, but a person/plan that does not listen to opinions n improve/evolve over time is also no good. Both SMOL n ur suggestions of Indexing is truly well considered already, just that execution yet to materialise. Note that the reason of my specific stock purchase is also relevant to my entire portfolio construction, where percentages allocation of growth, speculative, income, sectors diversification is taken into account, lest not forget bonds, cash, precious metals. i have learned from my 1st remisier's theory that there is just so much core capital in the market. So you will see "rotational buying and selling. Also each stock has it's own way up and own way down. Is that what you call the alpha & beta of stocks?